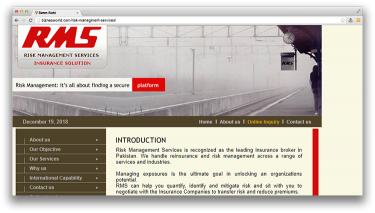 Description Risk Managment Services (Pvt) Ltd is the first foriegn insurance broker to get a licence from SECP. RMS provides complete insurance solutions to its clients including risk evaluation, best possible coverage available in market, claim handeling and other insurance related services. Dr. Ziauddin Ahmed Road karachi.